Stocks are down big time today, and there’s one reason — Europe. The machinations over how to deal with massive debt, a bailout plan and Greece’s viability as a member of the European Union (EU) is coming to a head this week, as policymakers in the region may have only a small window of opportunity to deal with a potentially explosive situation in the birthplace of democracy. Investors are becoming increasingly skeptical that European leaders will succeed at jump-starting the region’s economy and preventing a messy exit from the EU by Greece. That, in turn, is causing money to be taken off of the investment table, and hence the big slide in stocks here in the United States, in Europe and in emerging markets around the globe. On the currency front, investors also are abandoning the euro, which fell to its lowest level against the U.S. dollar in nearly two years. It seems as though the confidence in Europe’s common currency isn’t very robust and, as such, investors are fleeing to the relative safety of the greenback. This week, European leaders are meeting to try and find a way to keep the region’s debt crisis from spiraling out of control. They’ve also got to plan for what I think is the inevitable, and that is a departure of Greece from the European Union. If, in fact, this happens, we’re going to feel the ramifications throughout the global equity market — and that could make today’s selling, and the selling in recent weeks, minute by comparison. 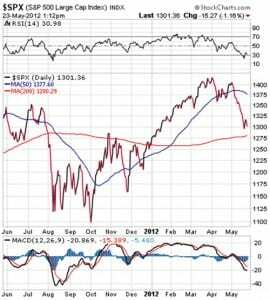 The threat of a European Union meltdown, and the concomitant flight of capital away from the region, is why I’ve been so cautious when it comes to equity allocations in my Successful Investing and High Monthly Income advisory services. The risk here is too high, and the threat of a continued sell-off of the kind we’ve seen during the past two weeks is just too great for me to recommend that subscribers put their serious money at risk. A look at the three charts below shows the devastating technical damage that investors would have suffered if they were holding stocks this month. As you can see, share prices have plummeted in the S&P 500 Index, the iShares MSCI Emerging Markets Index (EEM) and the iShares MSCI EAFE Index (EFA). 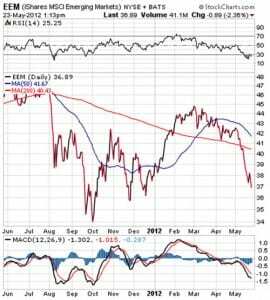 Both EEM and EFA now trade below their respective 200-day moving averages, and the S&P 500 could be next. Together, these three market segments represent the dangers posed to your money from the debt debacle in Europe. Until we get some clarity, and some agreement, from European policymakers on how to get things resolved in debt-ridden Europe, we are liable to suffer more euro-induced selling. The bottom line here is that you should steer clear of stocks, since there are way too many unknowns and yet-to-be-resolved issues in Europe. Instead of watching your money crater due to a European downpour, the better thing to do is to be on the sidelines and watch how the drama plays out this weekend. By Monday, we should have a good sense — for better or for worse — about how the whole issue of Greece and the EU is going to play out going forward. For now, be patient, and preserve capital. When the storm clouds clear, you’ll want to have plenty of cash on hand to buy attractively priced assets at a discount. The great American military leader knew that when it comes to war, the tiniest things make the difference. This theory also can be applied to investing, because here even the slightest mistake can send your holdings tumbling. In this precarious period for investors, it is more important than ever to make sure your decisions are precise. Even an eyelash-size error can hurt you in the long run, so be wise, and make sure you think out every financial move you make. 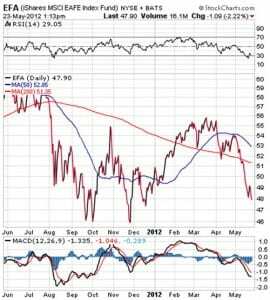 Exclusive Global Bull Market Portfolio Powering Ahead . . .